The Slammer & Squire course is located in the heart of our golf resort near Jacksonville, Florida and is one of St. Augustine Florida's favorite golf courses. The Slammer & Squire course officially opened to the public in May 1998 and has become a favorite Jacksonville Florida golf course. This 18-hole, 6,939-yard course was designed by architect Bobby Weed along with World Golf Hall of Fame Members, Sam Snead (the “Slammer”) and Gene Sarazen, (the “Squire”). 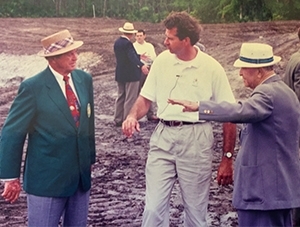 The three men shared a desire to build a golf course that would preserve the area’s natural beauty and reward good shot making….and that’s just what they did. This well-groomed course showcases the pristine, unspoiled wooded areas, wetlands and natural beauty of the region. It is relatively wide open with several contoured greens and impressive views of the World Golf Hall of Fame. You’ll discover a layout that places an emphasis on the short game which was reflective of the finesse game that made the “Slammer” and “Squire” legends. And, like the King & Bear, it features several water hazards; but the picturesque views of the World Golf Hall of Fame will definitely overshadow any challenges you may face. In fact, you can almost hear the voices of legends rooting you on as you make your way to the 18th green. The course was the host site of the Liberty Mutual Legends of Golf, a Senior PGA TOUR event and hosted an array of other golf events such as the LPGA Senior Tour's Handa Cup from 2006 to 2009 and most recently the ANNIKA Invitational USA. The Slammer & Squire golf course is conveniently located off of I-95 in St. Augustine, Florida. It's near downtown Jacksonville, historic downtown St. Augustine, and the North Florida beaches. The Slammer & Squire makes a great round of golf as part of a Stay & Play package or simply for an afternoon out of the office. Onsite accommodations are available for out-of-town guests. Book your tee times online or call 904-940-6088 to play one of St Augustine’s favorite golf courses today!